Excellent Rental Couldn't have asked for a better rental situation. We have rented vacation homes for over a decade and this was one of our favorites for so many reasons. Great location, parking was a challenge but we figured it out.. The way the units are configured allowed for plenty of privacy and you didn't feel you were that close to Duval. Really are "tucked" away, felt like a private oasis. Loved the lighting and we enjoyed making dinner on the grill one night and eating poolside. Bike rentals at the end of the block worked out well. This was for our family with two grown sons. The upstairs toilet was a challenge for our 6'3" sons....but since there was a full bath downstairs, it was okay. Fabulous cottage close to all you want to be close to We booked on somewhat of a spur of the moment and could not have asked for a better location and amenities. The cottage was just adorable and we wound up with the pool and outdoor areas all to ourselves. It's even more charming than the pictures. We were just steps off Duval really and loved that there was a neighborhood grocery store just across the street to grab snacks and adult beverages. Street parking could have been a little bit of a concern but we got lucky and had free parking for the long weekend. It was perfect. Next time we are in Key West (and without any kids), this will be our go-to accommodations. As other reviewers have stated, this cottage is well located with high-quality finishes and a very comfortable interior. We only had 4 adults in our party and were glad that we did. The sleeping areas were perfectly situated with lovely French doors to each room which had privacy panels, great TV service and ceiling fans. The bathrooms are whimsical and bright! The only thing I would ask for is a luggage rack in each room as there are only built-in drawers and small 1/2 closet, but for those that want to just use their luggage it would be nice to have it elevated off the floor. Super clean throughout!! :) The outside space is just enough and has all you need to entertain comfortably. Roosters roaming the streets are a charming accent to this fun area and got us up early enough to grab great breakfasts out. Sandy's is very convenient around the corner for call ahead - take out breakfasts! There is NO Uber service right now in Key West but there are several taxi companies which seemed perfectly fine. Due to extreme heat, we opted for taxi service to many of our dinners from Mango. For those that want a romantic meal check out Latitudes (Sunset Key) but make sure you get reservations in advance. You will be please with a stay here! Amazing little paradise We loved everything about this rental! The location, the price and our caretaker and her dog Bebe! Everything was wonderful! Randy at key west hideaways was beyond helpful!! Thanks for a great trip!!! Fabulous 4th of July stay with family! This was our second time staying at Casa Margarita. This house is perfect. The location is on a quiet street, but still steps away from all the action. The pool and hot tub were fabulous. The home itself is cozy, clean and has everything you need to be comfortable. The kitchen had all the necessities. I can't wait until we visit Casa Margarita again! Paradise! 5 Stars This house is paradise! We stayed in Cosa Loca for my sisters bachelorette party and it exceeded all of our expectations! It is spacious and in the perfect location! There is no other place I would stay in Key West! We will definitely be back! I can not recommend Key West Hideaways and Cosa Loca enough! Absolutely perfect! Many thanks especially to Kevin for his attention to detail and hospitality!! He was professional, friendly, and really went the extra mile to make sure we were happy. 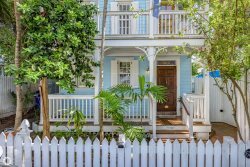 We highly recommend this property and Key West Hideaways! Would definitely stay here again. Beautiful Cottage! My friends and I thoroughly enjoyed our week at Mango Cottage just last week. The cottage is spotless and well appointed. It is beautifully decorated, comfortable, and had everything we needed.